For decades after he killed the University of Texas tower sniper, the late Austin police officer Houston McCoy dreamt he was drowning in a river as it filled with blood. “When Whitman fell, he fell near a drain, and blood was going into the drain,” said Charley Wilkison, who sat with McCoy as he was interviewed about the shooting at least twice before McCoy’s 2012 death. McCoy had just bought new boots, which were permanently stained after the nation’s first mass shooting on a college campus, said Wilkison, the executive director of the Combined Law Enforcement Associations of Texas. Another officer, Ramiro Martinez, was originally given credit for taking Whitman down. Later, McCoy was diagnosed with post-traumatic stress syndrome and battled alcoholism (Read McCoy’s personal account here). These days, much more is known about what officers experience in a shooting, and many departments like Austin have peer support programs to address officers’ mental health. In a forthcoming reporting series on officer-involved shootings of unarmed people, I hope to explore what officers – along with the people shot, witnesses and relatives – go through. I’m seeking all the perspectives I can get. I envisioned many different situations en route to a recent assignment covering GOP presidential nominee Donald Trump’s trip to Houston. But my list didn’t include what I saw at the end of the exhausting night: democratic debate. Trump first stopped by Houston attorney Tony Buzbee’s River Oaks home for a fundraiser, where attendees forked over thousands for a few moments with the mogul. Across the street from Buzbee’s lot, Houston police officers cordoned off protesters on one corner and directed Trump supporters to another. The two sides had a terse face-off – protesters blasted Tejano music while Trump supporters spoke to reporters – at the fundraiser, but there wasn’t much actual interaction. I then headed to Trump’s rally in The Woodlands, which attracted thousands of people. The line to get in started to form many hours before the 7 p.m. rally, and many people who’d waited in line in a scorching mall parking lot didn’t get in. Since Trump has yanked The Washington Post‘s credentials, I covered the scene outside of the Waterway Marriott. While there were reports of a person temporarily detained, I found people to be fairly calm. Law enforcement saturated the area, directing traffic and keeping watchful eyes on people expressing their opinions. I had been expecting confrontations to get heated after Trump’s audience filtered out, and there were passionate exchanges. But again, I found that law enforcement was vigilant while allowing for discord – at least once even standing between the two sides as they debated over metal barricades. As the night went on, many people left, but plenty of others stayed. I spent my time floating from one group of debaters to another, staying to get the gist of the arguments: immigration, LGBT issues, gun rights. All around me were clusters of people – again, with police watching closely – debating politics, of course some more crassly than others. I saw college students, hijab-clad women, people who were physically impaired and folks of all races, ages and shapes. Just as moviegoers might discuss a film on the way out of the theater, rally-goers and protesters seemed to want to talk it out, too. Eventually, officers asked people to leave and the crowds cleared out. The mall was once again just a mall, and Trump was off to stir someone else’s pot. Crowds of people outside of The Woodlands Waterway Marriott, where Donald Trump held a rally June 18. Susan Edwards, her husband and their Yorkie, Ms. Veronica, speak to the media outside of a June 18 Donald Trump fundraiser in Houston. Trump supporters, right, debate protesters, on far side, outside of a rally in The Woodlands June 18 while a law enforcement officer stands between the two sides. Jacob Mingear, 22, said Trump pointed him out and asked him to stand up for the audience at his rally in The Woodlands June 18. “There’s a movement of LGBT that’s moving towards Trump,” he said. Donald Trump supporters speak to the media and face protesters at a fundraiser in Houston June 18. Summer Stunner: The original light-shedder at the start of a Central Texas day in June. When talking about journalism’s role of being society’s watchdog, people often use the phrase “shed some light.” Well, this summer, I’m busy testing and retesting batteries, researching the best and brightest LED bulbs and otherwise preparing to do some illuminating starting in August. Then, I’ll be undertaking a year-long reporting project thanks to a grant that will allow me to write while I continue chipping away at my Master’s degree. In general, I’ll be researching and reporting on officer-involved shootings in the Lone Star State – but I’ll explain more in detail later. Meanwhile, I’m busy ramping everything up – but still can’t say “no” to a good freelance assignment. Last week, the Washington Post tapped me to help with their coverage of a training accident at Fort Hood in which nine soldiers were swept away by flood water. On Sunday, I took Austin American-Statesman Travel section readers with me to Seattle to relive a terrific trip we took to Seattle last year for a friend’s wedding. Stay tuned for more in the coming weeks about my upcoming project, I promise it will be worth your while. Until then, have a fantastic summer. Outside of a hearing at the Texas Capitol on judicial salaries, Nathan Hecht, chief justice of the Supreme Court of Texas, spoke to me about a problem plaguing Texas judges: fear. He said that judges who took a recent Office of Court Administration survey “overwhelmingly” reported that they fear personal harm because of decisions made on the bench. The November shooting of Travis County Judge Julie Kocurek prompted the survey, to which 43 percent of the state’s judges responded, according to OCA spokesman David Slayton. About 38 percent of the respondents “indicated feeling afraid for their personal safety at work in the past two years,” Slayton said. During the survey period – from Jan. 22 to Feb. 5 – 10 percent of respondents experienced that fear at least four times, and 7.4 percent “reported feeling afraid for their safety every day.” Almost 40 percent of judges who reported feeling afraid blamed their fear on a written or verbal threat. About 43 percent of the judges who responded feared for their safety away from work in the past five years, Slayton said, with 10 percent reporting that occurrence at least four times during the survey week and 4 percent reporting being afraid outside of work every day. To address this fear, Hecht said he plans to push the 85th legislature to better secure courthouses and “ask for more personal security for judges in their homes,” he said. Joining him at the Capitol will be Kocurek, Travis County’s presiding felony judge, who was shot in November outside of her home. She was released from the hospital on Christmas Day and has yet to return to work, a family spokesman said. Even so, Hecht said, Kocurek told him in a meeting Wednesday that she wanted to be a part of Hecht’s efforts. Hecht said Kocurek, who’s served on the bench for 17 years, could easily retire now. * the OCA report findings will be released in a few weeks, spokesman David Slayton said. Recently, I’ve been covering the city of Austin’s rules that govern transportation network companies for the Austin Monitor. In a 9-2 vote, Austin City Council voted last month to adopt a new ordinance that would require drivers for TNCs like Uber, Lyft and Get Me to submit their fingerprints for a federal background search. 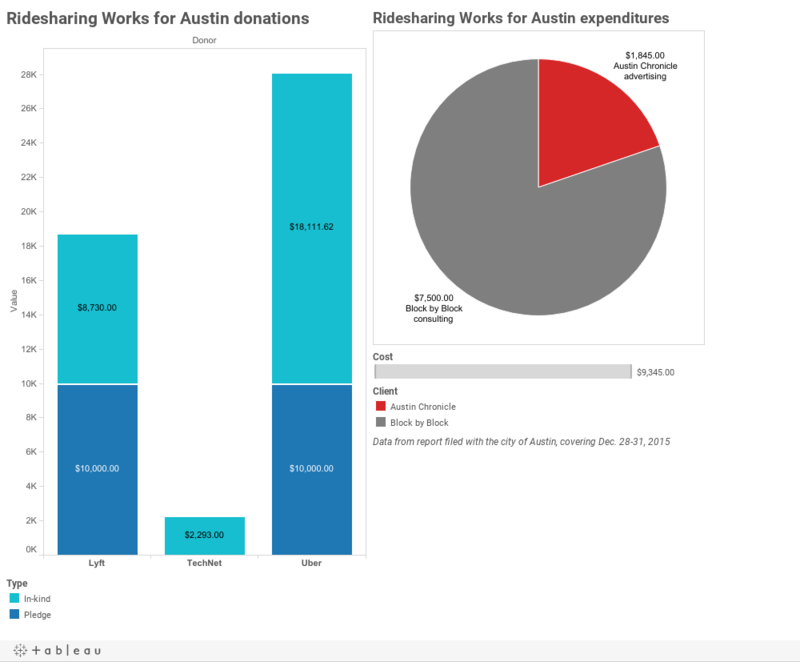 The companies oppose this, as they have in other cities, and waged war via a political action committee called Ridesharing Works for Austin. The PAC utilized a chapter of the city charter that requires council to either vote to overturn the ordinance or push the decision to a city-wide vote upon receiving a petition requesting as much with at least 20,000 valid signatures. The petition was presented to the city this week, paving the way for either a council decision reversal or a city-wide vote, in which case the PAC would likely raise and spend boucoups moolah on encouraging voters who support TNCs to vote. So how has the PAC raised – and spent – money so far? Please admire the following graphic, my latest attempt to keep my data journalism class skills fresh (data courtesy of the PAC’s report from 12/28/15-12/31/15, filed with the city here). Days before the release of the next installment of the podcast “Serial,” the U.S. Army announced that the show’s subject, Sgt. Bowe Bergdahl, will face a court-martial. Thursday will bring the second episode in Season Two (Season One, which won a Peabody Award, explored the death of Hae Min Lee). In a promo, narrator Sarah Koenig said it features “the Taliban’s version” of how they captured Bergdahl – who’d walked away from his post in Afghanistan in 2009 – and kept him captive for five years. Bergdahl faces charges of “desertion with intent to shirk important or hazardous duty” and “misbehavior before the enemy by endangering the safety of a command, unit or place.” A preliminary hearing officer recommended that Bergdahl should not face jail time for his offenses, although he could face up to life imprisonment. In the first episode, Bergdahl speaks to screenwriter Mark Boal about his escape, describing at first unrealistic self-confidence. Others might strive to be a perfect soldier, “but I wanted to prove that I was that,” he told Boal. Bergdahl said he left his base to alert Army leadership to what he saw as ineptness that endangered soldiers’ lives. Then came doubt and defeat, and a change of plans – he searched for someone making an IED so he could have something to offset the “hurricane of wrath” he anticipated once he reached superiors. He strayed from his plan for too long, he said. Motorcyclists then surrounded Bergdahl, who said there was “nowhere to go except Taliban.” For days, U.S. troops searched feverishly for him, at times risking their lives. Some of Bergdahl’s statements to Boal repeat a narrative from a September hearing in San Antonio. But Bergdahl didn’t speak at the hearing, and the podcast is the first people have heard of the soldier (which is a big deal for the dozen-or-so reporters like me who sat in the hearing wishing we could read his mind). Bergdahl was released in a prisoner swap and welcomed home in 2014, only to be criticized after rumors swirled that he’d deserted. After he was debriefed, Bergdahl relocated to San Antonio’s Fort Sam Houston, and was charged in March. Before the two-day September hearing, Bergdahl’s lawyers wondered how months of bad press and politicalization might affect the case. Upon the release of the first episode, Bergdahl’s lawyer Eugene R. Fidell told The Associated Press that the more the public could hear Bergdahl in his own words, the better. We again ask that Donald Trump cease his prejudicial months-long campaign of defamation against our client. We also ask that the House and Senate Armed Services Committees avoid any further statement for actions that prejudice our client’s right to a fair trial. Once considered among the worst states in providing legal defense for the poor, Texas is recognized as home of evidence-based best practices for indigent defense. To ensure improvements continue, the Texas Indigent Defense Commission and Public Policy Research Institute at Texas A&M University will spend the next two years creating a statewide portal for all indigent defense-related data, thanks to a $400,000 grant from the U.S. Department of Justice. Strides have certainly been made since the 2001 Texas Fair Defense Act, requiring counties to create an indigent defense plan and report some statistics to TIDC, which posts that information online. According to the TIDC, state expenses for indigent defense have increased by 150 percent in the last 13 years, and the number of cases paid by the state has risen by 80 percent. Still, there is much room for improvement, said TIDC Executive Director James Bethke. Edwin Colfax, TIDC’s grant manager, said they’ll work with several counties that are already collecting a plethora of data about caseloads, appointments and how cases are adjudicated. Counties currently use one of two types of systems, which were built using TIDC’s discretionary grants. Bethke said the portal is meant to be a repository of information for interested parties to dissect, “to make the local stakeholders aware.” His agency is responsible for auditing indigent defense systems across Texas’ 254 counties, and can withhold funding – about 10-15 percent of a county’s indigent defense budget – if wrongdoing is found. “Our stick is withholding funding. But the bigger stick is sunshine. If they fall behind on legal requirements, this information is public in our reports, and puts sunshine on issues,” he said. Currently, TIDC is auditing Harris County, recently highlighted in the Texas Observer’s “How Harris County’s Indigent Defense Penalizes the Poor.” (Bethke said the audit was planned before the story ran, and is one of a dozen audits TIDC will conduct each year to determine if policies are being followed. The State Commission on Judicial Conduct and State Bar of Texas police judges and attorneys, respectively). A little background: Some 23 counties have a designated public defender, who only takes indigent defense cases. To handle the majority of cases, though, counties depend on a system generally called “the wheel” that intends to randomly assign cases to willing attorneys. Statewide, there are about 6,000 lawyers who take indigent defense appointments, Bethke said.